Let’s say you indulge yourself after a lifetime's worth of longing from a distance, swing by that fancy car dealership you drive past every day, and decide that today’s the day -- that lovely example of exceptional German engineering will finally be yours. After making such a momentous investment, both in money and the effort exerted throughout a long and laborious career, you aren’t going to let just anyone work on your world-class automobile to keep it running as silky smooth as possible. In other words, although Larry from down the block seems like a great guy, he won’t be the one tuning up your car just because he likes to tinker with old Fords and has had oil-stained hands since the Mavs’ last title. No, you’re going to be taking your lightning fast fusion of art and science to experts -- no offense, Larry. At Embark, we look at our organization like that German sports car, a meticulously crafted work of remarkable precision that is the product of countless hours of thought, effort, and strategy. Our people, clients, goals, and expectations are far too important to entrust Embark’s collective well-being to mere intuition or anyone without extreme insight and skill. 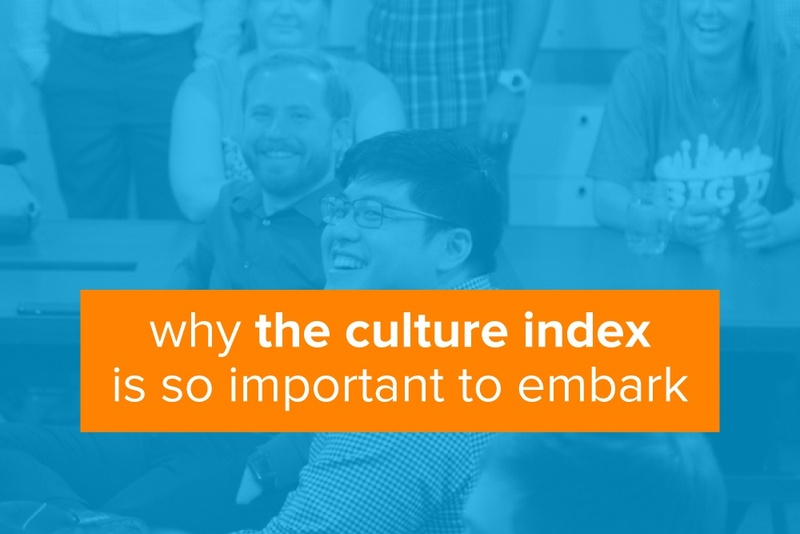 For that reason and dozens more, Embark relies on the fine people at Culture Index to help our firm reach its potential, make the absolute most of our team, and uncover issues that might otherwise go unnoticed until impacting the firm. As you likely already know, Embark has done a pretty darn good job developing a productive, innovative, and healthy environment. Afterall, being recognized as one Inc. Magazine’s Best Workplaces for 2018 doesn’t just happen out of coincidence or having a spiffy new haircut. Still, even the best organizations need guidance and insight to grow and improve which, of course, are precisely what Culture Index provides. Assessment: Culture Index creates and delivers a quick survey that our team completes through their web portal. The survey generates our team analytics that Culture Index uses to measure seven work-related traits. Translation: Culture Index then analyzes the data and shares their findings in a peer-to-peer format to ensure absolute clarity. This personalized approach helps facilitate any needed change within our team. Mobilization: People data only drives needed improvement if it’s first transformed into meaningful insight. Culture Index provides actionable executive feedback to turn that data into immediate results. However, as vital as those concepts and qualities are to Embark’s operations and success, there’s also a critical qualitative component to our work with Culture Index as well. The surveys and results aren’t about effort, aptitude, or ambition but, instead, are an incomparable gauge of our culture, the work behaviors that help foster that culture, and management’s decision-making process to make sure it continues to evolve and improve over time. Given the tremendous value and respect we place in their abilities and insights, Embark takes Culture Index’s analysis and suggestions to heart, using them to gain a far better understanding of the specific strengths and weaknesses of our team members, and mold our decisions around those qualities to maximize results. Of course, no survey could ever measure ambition or how hard someone works. But by knowing and managing to those strengths, everyone wins, including our clients. At the risk of sounding repetitive, Embark is a special place that will always put our people first. That’s one of the reasons why we’re so selective with whom we bring on onboard to join our team -- our culture and team members are who we are, the star to which the firm’s solar system revolves around. Everyone on our team needs to be able to thrive in our work environment, revel in its uniqueness, and add to the equation, never subtract from it. Culture Index provides us the information needed to understand how our people communicate, interpret data, and reveals the most effective ways to foster their development. To a person, if we're all pulling our weight, making sure we're continually improving, and helping our teammates do the same, the sky’s the limit for Embark. Culture Index helps us stay on that path, correct course when needed, and never stop reaching for our lofty ideals.